Home » What is FlightPath? FlightPath is an open source, web-based academic advising and degree audit system. 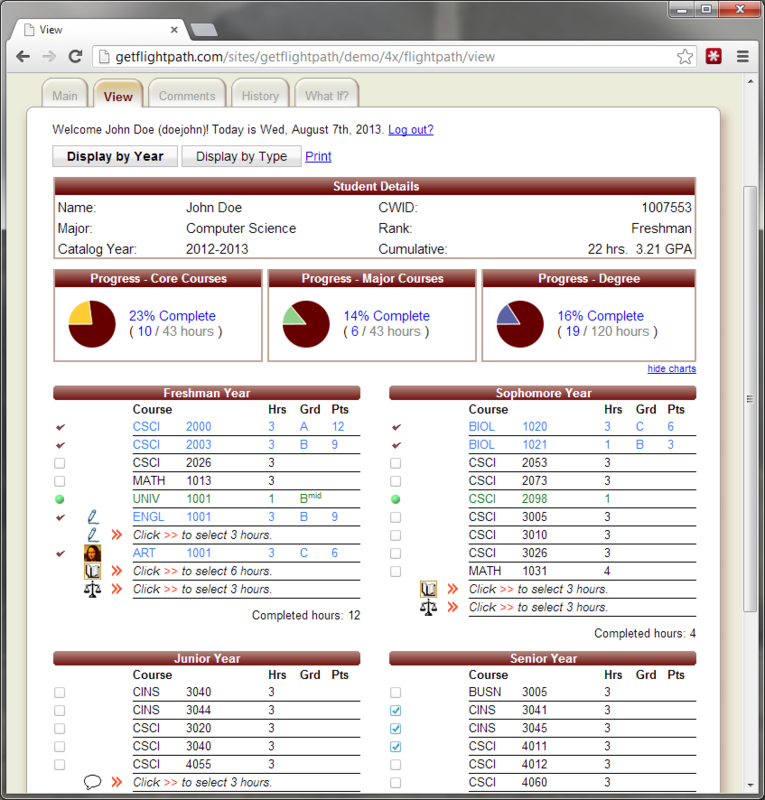 It's unique design makes advising students and managing records easier than ever before. Students love it for its clean, friendly interface and features. Advisers love it for its fool-proof advising, reporting, and auditing. Administrators love it for its ease-of-use and money-saving solutions. At FlightPath Labs, we host and support FlightPath for you, so your school doesn't need to tie up its IT resources in the technical details and headaches of hosting. You always have the latest features, and on request, you can have new features and functionality developed just for your school. Easily advise students in their degrees with a simple point-and-click design. "Try out" other degrees to see how a student's coursework fits in. Substitutions, transfer credits, prereqs-- all handled simply and intuitively. Mobile-ready design, works seamlessly in a mobile phone or integrated into an existing app. Schedule your demo of FlightPath Labs today! The "community" self-hosted version of FlightPath is available at http://getflightpath.com.